THE HOCKEY SCHTICK: New paper blames typhoon Haiyan on the global warming "hiatus"
New paper blames typhoon Haiyan on the global warming "hiatus"
"Though there is speculation to associate global warming with [the intensity of Haiyan], existing research indicate that we have been in a warming hiatus period, with the hiatus attributed to the La Niña-like multi-decadal phenomenon. It is thus intriguing to understand why Haiyan can occur during hiatus." 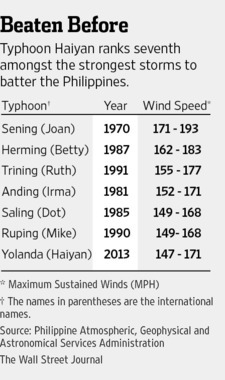 Although typhoon Haiyan was, according to the Philippine Atmospheric Administration, the seventh strongest storm to hit the Philippines, Typhoon Sening, which hit during the low-CO2 1970's ice age scare, was the strongest storm recorded. According to the paper, the "La Niña-like multi-decadal" "hiatus" "suggests that as the western Pacific manifestation of the La Niña-like phenomenon is to pile up warm subsurface water to the west, the western North Pacific experienced evident subsurface warming and created a very favorable ocean pre-condition for Haiyan." However, multi-decadal La Niña-like and El Nino-like periods have occurred for many millennia and there is no evidence of any link of these natural phenomena to carbon dioxide levels, and thus, no evidence of any link of Haiyan to either AGW or the alleged "hiatus" of AGW. Global warming "hiatus deniers" such as Cook's 'Skeptical Science' blog and his side-kick propagandist Dana Nuccitelli continue to foolishly claim global warming is "accelerating," despite the hundreds of peer-reviewed papers in the literature now acknowledging the 18+ year "pause" or "hiatus" of global warming, including this new paper as well. With the extra-ordinary intensity of 170 kts, super-typhoon Haiyan devastated the Philippines in November 2013. This intensity is among the highest ever observed for tropical cyclones (TCs) globally, 35 kts well above the threshold of the existing highest category of 5. Though there is speculation to associate global warming with such intensity, existing research indicate that we have been in a warming hiatus period, with the hiatus attributed to the La Niña-like multi-decadal phenomenon. It is thus intriguing to understand why Haiyan can occur during hiatus. It is suggested that as the western Pacific manifestation of the La Niña-like phenomenon is to pile up warm subsurface water to the west, the western North Pacific experienced evident subsurface warming and created a very favorable ocean pre-condition for Haiyan. Together with its fast travelling speed, the air-sea flux supply was 158% as compared to normal for intensification. The strongest storm on record could have happened without an excess of CO2. The seventh-largest storm, however, could only be due to the effects of excess CO2. That's just science, and not up for debate. Seriously, I would have been kicked out of several university classes for that level of intellectual sloppiness. I mean that literally. I had at least two professors who would have said, "You can't be here anymore" without any further discussion.